Today's review is on the February 2018 Vegan Cuts Beauty Box. 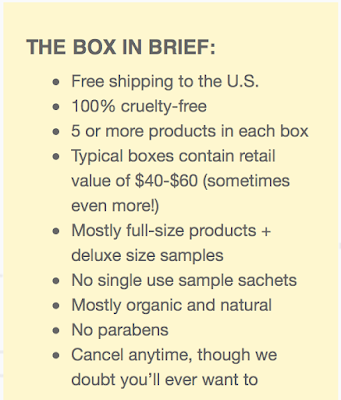 This is a subscription service that arrives at your door each month and is filled with vegan & cruelty-free beauty products. I'd first like to say that although I post lots of juicing recipes and vegan meals/cooking on Instagram, I am not vegan. I try to eat a plant-based diet because of the health benefits and I do notice that my skin looks so much better. However, I still indulge in an occasional ice cream/gelato, egg and I do eat some fish every now and then. I wanted to be upfront about my lifestyle because as a blogger, I feel that I need to be as transparent as possible. 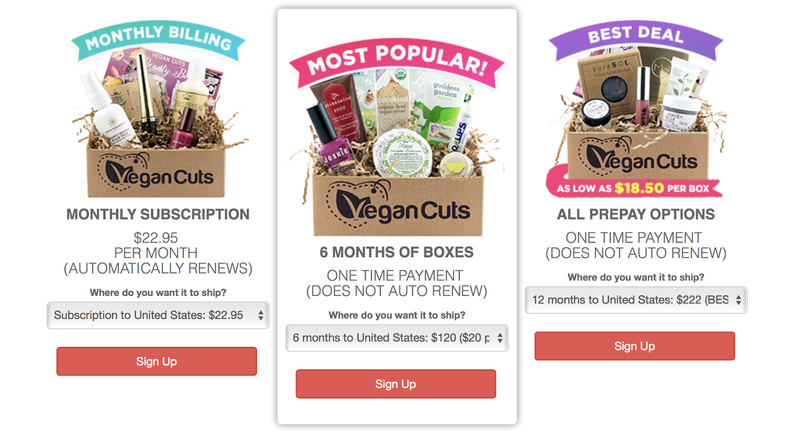 Vegan Cuts is a monthly subscription service that you can either pay month to month, every 6 months, or for the best value, pay for 1 year. Here you can see that each box contains full size or deluxe size samples with no sample packets! Woot Woot. I don't know about you but I can't properly test out a product to determine if I like it or not using 1 use sample sachets. 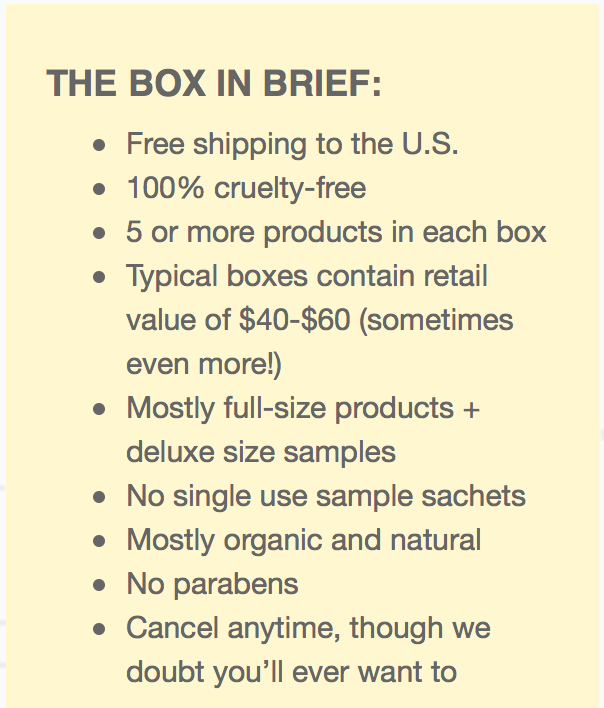 I have subscribed to other monthly beauty boxes and finding sample sachets is a little disappointing so I was excited to know that Vegan Cuts don't include those sachets. Let's take a closer look at the items included in February's box. To be perfectly honest, I have never been a huge fan of subscription boxes. I have tried several subscriptions services from beauty boxes, sheet masks boxes, and snack boxes over the years and I haven't been that impressed. I will admit that when Vegan Cuts reached out I hesitated but I thought I'd give it a try. I am glad I did. I think there is a lot of value here and the box came with a great variety of products. I have already started using the Derma E Moisturizer, the Saiva Foot Balm, and the Luscious Lip Crayon. I really enjoy the lip crayon because it looks so natural and the lip lining aspect helps define my thin lips (see pictures above). I already want to purchase more colors! I especially love the foot balm because it smells so good and it has moisturized & softened my dry feet, especially my heels. 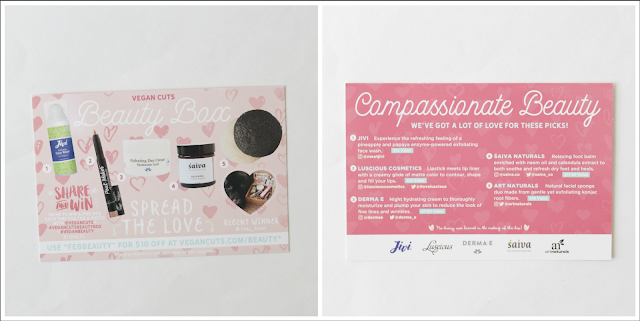 I have gotten a lot of use out of this box already and feel that Vegan Cuts did a great job of curating their February box. There's a nice variety of products that everyone can use and incorporate into their routine. I would highly recommend this box and will continue my subscription!